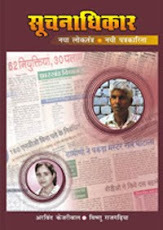 Book on RTI, written by Ms. Nandini Sahai and Vishnu Rajgadia, Published by UNESCO, FES-India and MICCI has been released on 12th of October 2008, the third anniversary of the Right to Information. The Ex. Chief Minister and Leader of opposition in Jharkhand Mr. Arjun Munda released the book during a seminar on RTI organized by Jharkhand RTI Forum and Junior Chamber International in JCI Hall Ranchi. The State Information Commissioners Mr. Shristidhar Mahto and Gangotry Kujur, Mr. Balram (President of Jharkhand RTI Forum), Mr. Vishnu Rajgadia (Secretary of Jharkhand RTI Forum), Gautam Kumar (President of JCI] Ranchi) and Mr. Raajesh Kasera (Chairman, JCI RTI Cell were present on dias). The event has been covered by the media at large.